Families in Northeastern Pennsylvania confront severe economic challenges, including elevated levels of unemployment and extreme poverty. While there are many families that fall below the “official” measure of poverty — the federal poverty line — there are also many who work full-time but earn less than a living wage. Individuals and families lack economic security in both cases; but the latter find themselves in an ambiguous situation, which this report seeks to clarify. To be classified as economically secure, a household must earn wages that allow its members to meet their “essential basic needs and live a modest but dignified life.” The living-wage threshold represents the amount of income required to achieve this standard of living. This living wage study was prepared by the Institute for Public Policy & Economic Development in partnership with Education for Justice and the Office of Community & Government Relations at The University of Scranton, and with additional collaboration from Campus Ministries’ Center for Service and Social Justice and the Department of Communication. The full report can be found online at www.scranton.edu/livingwage. Recommendations are provided below. Specific advocacy opportunities provided by Catholic and Jesuit partner organizations will be added if and when they become available. To achieve family economic security, a multi-pronged approach is required that involves economic and workforce development, government social safety net programs, and private charitable activities. 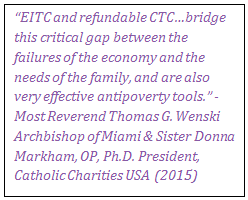 The following recommendations reflect conclusions drawn from the data presented in this report and based on the advocacy efforts and policy positions of Catholic Charities USA and the U.S. Conference of Catholic Bishops, illustrating the rich discussion of poverty, just wages, and economic justice present in Catholic Social Teaching. Increase wages: As indicated from our analysis of the minimum and living wages in the Commonwealth of Pennsylvania, the minimum wage does not meet the basic needs required by families, and falls short of a living wage. A “living wage” changes depending on how many people are in a family. However, for the family classifications studied, reaching a living standard that is “modest” is nearly impossible earning $7.25 an hour. Thus, the best way to help families thrive, rather than merely survive, in today’s economy is to find ways to increase wages. This can be done through increases to the state and/or federal minimum wage and/or through economic development activities that seek to increase jobs with meaningful, family-sustaining wages. Workforce development programs, which help to create well-trained prospective employees, in Lackawanna and Luzerne counties, should also be expanded. These programs have the potential to help low-wage workers improve their skill sets, attain higher-paying jobs, and spur economic growth in the region. Support tax credits for low-income families: Federal income tax credits, including the Child Tax Credit (CTC) and Earned Income Tax Credit (EITC), help defray costs for working families. 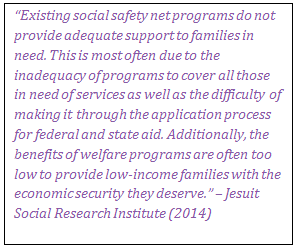 Increases to both programs would enhance these families’ economic security. The EITC, with its eligibility guidelines as discussed above, provides small sums of financial assistance to low-income families based on annual earnings. This extra amount of money could assist minimum-wage earners in covering the gaps that they encounter between their minimum wage income and a living wage income. It cannot be utilized unless the individual or family is already working, and is refundable in the sense that any additional dollar beyond a family’s income tax liability is paid as a tax refund. The Child Tax Credit provides important assistance to help working families obtain safe, quality child care, an option that is often beyond the reach of parents working low and moderate-wage jobs. How should we respond? As employers, elected officials, students, and private citizens, we all have a role to play in attending to the needs of the vulnerable. For more families to be able to attain a “living wage” in Northeastern Pennsylvania, a combination of institutional, governmental, and private charitable activities are needed to increase wages and support low-income families. Catholic Social Teaching asserts that all people have a right to participate in society and calls on people of goodwill to consider how they can help to alleviate social inequities. As a Catholic and Jesuit institution, The University of Scranton is committed to an educational mission that includes the service of faith and the promotion of justice. The University draws on the efforts of Catholic Charities USA, the U.S. Conference of Catholic Bishops and other partners to raise awareness of and advocate for public policies in keeping with emphases within Catholic Social Teaching on principles of human dignity, community and the common good, dignity of work and the rights of workers, solidarity, the option for the poor and vulnerable, and the role of government and subsidiarity. 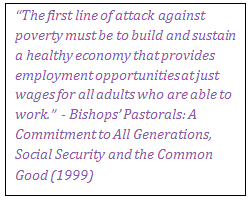 U.S. Conference of Catholic Bishops: Economic Justice for All Pastoral Letter on Catholic Social Teaching and the U.S. Economy, 1986. U.S. Conference of Catholic Bishops: A Place at the Table: A Catholic Recommitment to Overcome Poverty and Respect the Dignity of all God’s Children, 2002. 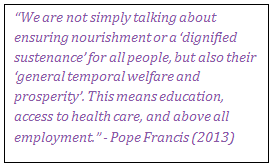 Pope Francis: Evangelii Gaudium (Apostolic Exhortation on the Joy of the Gospel), 2013. 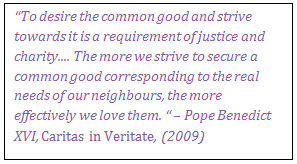 Pope Benedict: Caritas in Veritate (Encyclical Letter on Integral Human Development in Charity and Truth), 2009. 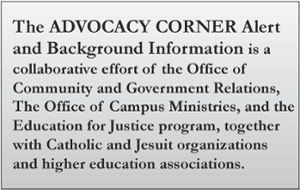 The ADVOCACY CORNER Alert and Background Information is a new and ongoing collaborative effort of the Office of Community and Government Relations, The Office of Campus Ministries, and the Education for Justice program together with Catholic and Jesuit organizations and higher education associations. For more information about this initiative, contact community@scranton.edu or call 570-941-4419. Students interested in getting more involved in advocacy and other justice related initiatives by joining the Catholic Relief Services (CRS) Ambassadors Group, can contact Club President Erin McCormick at erin.mccormick@scranton.edu or moderator, Lori Moran at lori.moran@scranton.edu.